Asphalt Crack Repair: How Much Does It Cost? When it comes to a property you own, like commercial buildings, or your home, all work that goes into the property is an investment. An investment means that you are putting in or allocating money towards something with the expectation of getting some sort of benefit from it in the future. When you invest in your property’s asphalt, the expectation of return is increased curb appeal, safety and liability coverage, proper traffic flow, and protection of your home or structural components of the property by having proper drainage, etc. As with most investments, protecting them requires some work and upkeep. Maintaining your asphalt is the absolute most important way to protect your asphalt investment. This protection and upkeep will help it to last longer, and maintain its value. 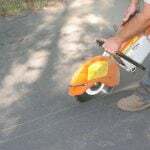 Asphalt crack repair is the most important asphalt repair and maintenance practice. 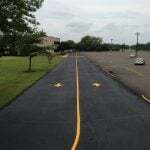 Not only is asphalt crack repair largely important in protecting and maintaining your parking lot or driveway, but it is also cheap. Routine asphalt crack repair goes a long way in preventing the overall deterioration of your asphalt surface, because it helps to protect its base. Once asphalt’s base is compromised in any way, overall deterioration will happen quicker. How much does asphalt crack repair cost? For each project, size of job, and the number of days/trips required for completion will play a part in determining the final cost of your project. But, on average, you can expect to pay anywhere from 45-75 cents per foot. How does asphalt crack repair work? 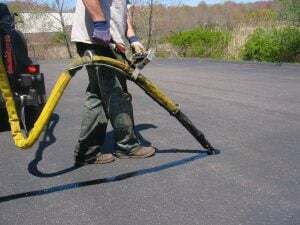 By using hot rubberized asphalt crack filler on minor cracks in your pavement, you are sealing small problems, helping to prevent bigger ones from happening. Water is one of the most damaging elements to asphalt, so when the surface of asphalt becomes cracked, water can enter the crack. When the water enters the crack, is creates more damages deeper in the pavement leading to larger cracks, and potentially creating potholes. Once water penetrates the base, the overall structure of your asphalt can begin to weaken and become compromised. Routine crack filling helps to prevent these larger damages from occurring. If these bigger damages do occur, it could lead to larger maintenance items like pothole repair and patching, or even asphalt replacement (higher cost items). Putting it together – huge ROI! 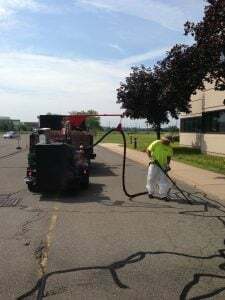 By following a regular maintenance plan for your asphalt that includes crack filling, you are proactively protecting your pavement and working to prevent the need for larger repairs. So, at less than a dollar per foot, you’re paying a small price for large protection = high ROI! How often should asphalt crack repair be done? You should be properly sealing and filling cracks on an annual or biennial basis at a minimal. Additional crack filler service should be performed when needed. Before applying asphalt sealer, have your cracks filled. 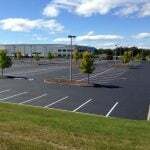 By diligently maintaining your parking lot and/or driveway, you are ultimately saving money in the long run by preventing larger, more costly repairs/updates. 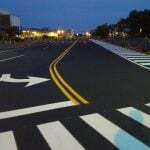 Asphalt crack repair services work best in protecting your asphalt when in conjunction with other repair services like sealcoating, pothole repair, patching, etc. Contact EastCoat Pavement Services today for your free consultation and proactively protect your pavement investment with the proper maintenance plan!